Google keeps updating its SEO rules and that means you’ve got to keep changing what you’ve got going on on your website if you want to keep ranking well. The thing that you’ve got to remember is that it’s not just new content that has to follow these new rules, but also old content. So with that thought in mind, here are some vital aspects to pay attention to and to make sure you upgrade as quickly as possible. For if you don’t, you might well find that the Panda update and those that followed have gouged your rating and prevent you from ever climbing the rankings again. The first thing that you’ve got to make sure you get rid of is pages that are exactly the same (or even highly similar). 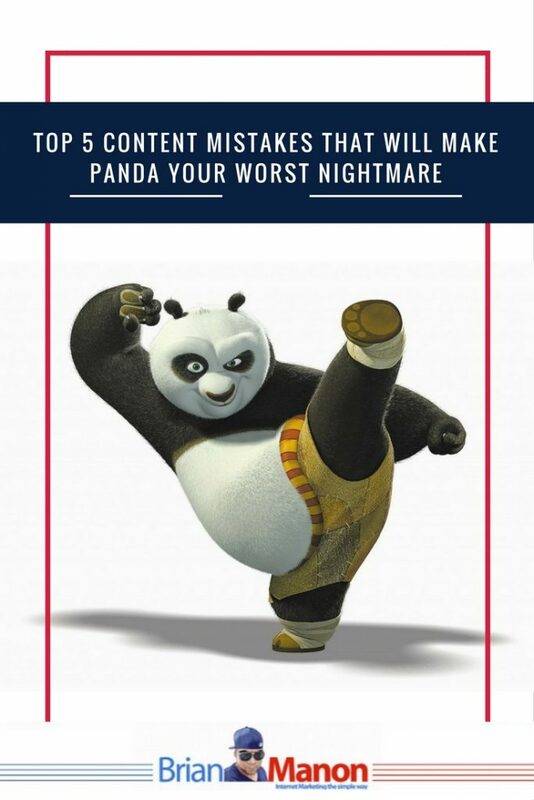 Panda doesn’t like those and punishes both pages as a result. Now, you might not think you’ve got duplicate pages, but it happens a lot more quickly than you might think. For example, you might have created a duplicate of a main page for some kind of promotion and then forgotten about it. If that is the case, Google won’t have. They never forget. Sometimes you’d wish them to. Like when you had that drunken ramble on Reddit and you regretted it the next day. So check for duplicates and get rid of them as ASAP. For the same reason outlined above, Google’s Panda update also does not like syndication. It will assume you’re trying to game the system. There is a way around this, fortunately. And that is if the news article points to the original article. If that’s the case then Google will know which is meant to be the original URL and will give that one priority. So go to wherever you’ve syndicated your article and make sure you include a link to the original article in that text. That will make it possible to avoid this kind of trouble. Sometimes you’ll write an article but you won’t be sure what keywords you want to rank for. You might think that the solution is to create a very similar article which largely uses the same text, but replaces one set of keywords with another. Again, this will not help your ranking. In fact, it will hurt it quite badly. So don’t do it. If you really want to rank well for two different sets of keywords, then make sure that you rewrite the article. It can still say the same things. It just has to do so in different words to make sure you get good website ratings. Does this also happen when you’re A/B testing? Yes, it does. So go ahead and A/B test the heck out of your website, just make sure that you put in meta tags for Google to not index the page. Then, when you’re done with the test, take down the pages that didn’t make the cut so that people don’t direct to the wrong page. Note that this can also be relevant for e-commerce websites that end up being very similar as a result of selling a very similar product. Google does not like it when your websites doesn’t contain a lot of copy. They prefer pages that have at least 300 words on them. Yes, this does mean that your pictures only pages can be unduly penalized and that is obviously something you want to do something about. The best thing to do is to put up a short description. 300 words isn’t that much, after all. Another strategy that will work if you’ve got an active community is to have people comment regularly and that will quickly fill up the page with 300 words or more. If all that isn’t possible, then again go for the noindex meta tag. That will tell Google to not bother with the page, which will make it not weigh down the rest of your site. Google knows what people like and what they don’t like. What they don’t like is a huge amount of ads. So make sure that you don’t get tempted into putting up banners and lots of things like that, as that will most certainly reduce the ranking of your page. In the end, even if Google wouldn’t downgrade you for it, you’d still suffer. People simply don’t want lots of ads. It is better, therefore, to put up a few high-quality ads than to bomb your audience with dozens of the things. That will be better for you, for Google and for your audience. Really, the best thing you can do is get rid of dead wood. When you’ve got pages which aren’t performing and which aren’t offering unique information to your audience, consider just getting rid of them. This will avoid all sorts of problems down the line and will make it far less likely your pages will interfere with each other. Sure, you can rehabilitate those pages, if you want to and you think they’ve got some worth, but only if that’s the case. Otherwise, consider scrapping them. After all, more is not always better and you don’t want to be the Chinese restaurant of the internet. You want to have a limited selection of high-quality pages that serve your visitors exactly what they want. In this way, you’ll be far more likely to actually convert those visitors into actually paying customers. And that’s what we all want, isn’t it? Very helpful, I tell people about duplicates all the time and they don’t believe it especially with guestposts. The syndication was interesting and food for thought. Content marketing is not, in itself, a miracle cure for a struggling business. But it can be a great way to establish your brand and present your business as a trusted, helpful “friend” to your target customers. Avoid these common content marketing mistakes, and you’ll be well on your way to developing content that effectively markets your business.